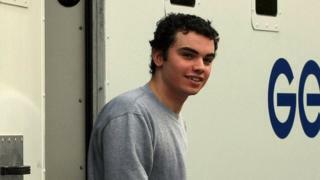 A 19-year-old who plotted a massacre at his former college has been jailed for life with a minimum term of eight years. Liam Lyburd was convicted at Newcastle Crown Court of possessing an arsenal of weapons including pipe bombs and a gun, with intent to endanger life. The judge said his threats showed he was a significant risk to the public. In a deleted file recovered from his computer, Lyburd wrote: "People will die, there's no question about that." Jurors heard the "cold and detached" teenager held a grudge against his former college after he was kicked off his course for bad behaviour. Lyburd, of Hamilton Place, Newcastle, said he had not intended to hurt anyone at Newcastle College. Police found a cache of weapons, a "kill bag" containing overalls, a mask, boots and pipe bombs at his home after they were tipped off by a member of the public concerned about his Facebook postings talking about launching a murderous attack. The bag also contained a Glock pistol and 94 hollow-tipped expanding bullets. Officers recovered webcam pictures Lyburd took of himself dressed for combat, armed with the pistol and brandishing a knife. In the deleted file he said: "You people ruined my whole life, don't expect me to show mercy today. No-one disrespects me and gets away with it. "I'll teach you people a little lesson on respect with my 9mm jacketed hollow points." Det Supt George Duff, who led the investigation, said Lyburd was a "dangerous man who intended to cause serious harm". "He at no point has shown any remorse for what he intended to do," he said. Judge Paul Sloan QC commended the member of the public who alerted police to Lyburd's behaviour. He told Lyburd that, if they had not, "it was only a matter of time before you would have put your plan into action". "Your emotional coldness and detachment and your lack of empathy to others was self-evident," he said. Lyburd was warned the psychiatric evidence suggested it might be a "very long time indeed" before he is considered safe enough to be released. He laughed as he was taken away by police, telling officers they had saved lives and prevented what would have otherwise been a massacre at the college.